Dr. Young-Key Kim-Renaud is Professor Emeritus of Korean language and Culture and International Affairs of the East Asian Languages and Literatures Department. She is currently Senior Advisor of the GW Institute for Korean Studies. She was Chair of the Department of East Asian Languages and Literatures from 2002 to 2014. In the fall semester of 2014, she was a visiting professor at Nanjing University School of Foreign Studies, teaching two linguistics courses. She is the initiator and a co-convener of the annual Hahn Moo-Sook Colloquium in the Korean Humanities series at GW. Before joining GW, Dr. Kim-Renaud served as Assistant Program Director for Linguistics at the U.S. National Science Foundation (NSF). In 1986-87, she taught at Harvard University as a visiting lecturer. She is past President of the International Circle of Korean Linguistics (ICKL) and has been the Editor-in-Chief of its journal, Korean Linguistics, since 2002. Dr. Kim-Renaud has received major research awards and grants, including three Fulbright awards, twice for Korea and once for Jordan. She has won individual research grants from the Korea Foundation, the Korea Research Foundation, the American Council of Learned Societies and the Social Science Research Council, the Academy of Korean Studies, and the ROK Arts and Culture Foundation. She has received program and institutional grants for GW from the Korea Foundation, the Korea Research Foundation, as well as the ROK Ministries of Education, of Information, and of Culture. She has also won support for GW's Korean program from the Consortium of Universities of the Washington, DC, Metropolitan Area. Dr. Kim-Renaud helped raise six endowment funds in Korean studies at GW, the most recent one for an endowment fund to create a faculty position in Korean literature/humanities. 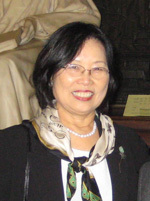 She has organized and chaired major international conferences such as the 1992 International Conference on Korean Linguistics, the 1992 Symposium on the Korean Writing System, the 1998 Conference on Women in the Korean Humanities, and the 2017 inaugural conference on the Korean humanities and the Korean diaspora, commemorating the opening of GW’s Institute for Korean Studies. She has also organized numerous cultural events, including the 1990 Korean Film Festival for 22 American universities, Kayagum concerts, and a Taekwondo ballet performance. She curated the 1992 exhibition on Korea's 15th-century King Sejong in Washington. She has organized various programs jointly with the Freer and Sackler Galleries and the Asian Pacific American Program of the Smithsonian Institution since 2002. She has also organized or participated in outreach programs in cooperation with Korean and Korean-American communities, the Korea Foundation, and the Korean Embassy. As a Korean language and culture and international affairs expert, Dr. Kim-Renaud, has testified in U.S. courts for both criminal and civil cases and has been interviewed by various U.S. and Korean media including the U.S. National Public Radio, the New York Times, and the Washington Post, and the Korean KBS, MBC, YTN, and Segye Times. Dr. Kim-Renaud was inducted into two honor societies, Phi Kappa Phi and Phi Beta Delta, and she was elected to the Cosmos Club in 2000. In 2002, some thirty colleagues from all around the world contributed articles for a Festschrift dedicated to her entitled Pathways into Korean Language and Culture: Essays in Honor of Young-Key Kim-Renaud. In 2003, she received the Global Korea Award (GKA) from the Council on Korean Studies at Michigan State University. On the Korean Alphabet Day, October 9, 2006, Dr. Kim-Renaud received the Republic of Korea Order of Cultural Merit, Jade Class (Taehanmin'guk Okkwan Munhwa Hunjang) for her life-time contribution to the advancement of Korean language and culture. In 2008 she was chosen as the winner of a Bichumi Grand Award by the Samsung Life Foundation in Korea as the Woman of the Year for Public Service. In 2012, she won the “New Writer of the Year Award” from the Korean Literary Society of Washington. Dr. Kim-Renaud has been interested in a wide range of research topics in both language and culture. Her Ph.D. dissertation on Korean consonantal phonology written in 1974 is still one of the most frequently cited works in Korean linguistics. She has also been working on two Korean linguistic phenomena that are shared only by Japanese: sound symbolism and honorification. One of her ongoing research interests is how language change reflects social change. (1) A pedagogical book, Business Korean, co-authored with Miok Pak, under contract with Routledge (London and NY). Dr. Kim-Renaud received a B.A. in English from Ewha Womans University in Seoul, Korea; an M.A. in Linguistics from the University of California, Berkeley; a graduate degree in French from Sorbonne, University of Paris; and a Ph.D. in Linguistics from the University of Hawaii. She also studied German in Heidelberg, Germany and Spanish in the University of Madrid. A theoretical linguist with a broad interest in the Korean humanities and Asian affairs, Dr. Kim-Renaud has published widely on Korean linguistics, the Korean writing system, language and society, language and politics, cross-cultural communications, Korean cultural history and current affairs. Her publications include eleven books: Korean Consonantal Phonology (Tower Press 1975; reprinted by Hanshin Publishing 1991 and 1995); Studies in Korean Linguistics: Followed by an Interview with Noam Chomsky (Hanshin Publishing, 1986); The Korean Alphabet: Its History and Structure (University of Hawaii Press, 1997); Theoretical Issues in Korean Linguistics (CSLI, Stanford University, 1994); Studies in Korean Syntax and Semantics by Susumu Kuno et al., co-edited with John B. Whitman (International Circle of Korean Linguistics, 2004); King Sejong the Great: The Light of 15th-Century Korea (International Circle of Korean Linguistics, 1992, 1997), translated into Korean (Sin’gu Publishing, 1998) and into German (Edition Peperkorn, 2002); Creative Women of Korea: From the Fifteenth Century to the Twentieth Century (M. E. Sharpe, 2003); And So Flows History, English translation of Hahn Moo-Sook's Korean original, Yoksanŭn hŭrŭnda (University of Hawaii Press, 2005); Pungyohan pujae (Plentiful Absence) II: A Festschrift in Honor of Paengnong Jin-Heung Kim, co-edited with Hoagy Kim (Salmgwa Kkum Publishing Co., 2006); Korean: An Essential Grammar (London: Routledge, 2009); and Wŏshingt’ŏn Munhak (Korean Literature of Washington) 19, an anthology of the works by the members of The Korean Literary Society of Washington (Seoul: Worin Publishing Company, 2016.) She has edited three biennial issues and four biannual issues of the Korean Linguistics journal, and published numerous scholarly articles and book chapters.